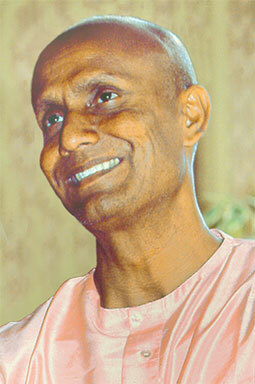 Sri Chinmoy (1931-2007) was not only a prolific spiritual master and man of peace but also a man of records. In the music world he surprised the spiritual world with a 170-instrument concert in the Swiss Alps, in Interlaken, on September 11, 2005. His focus was not musical perfection but maintaining a high meditative consciousness during a day-long performance. This video brings you most of the played instruments and some comments of visitors at the end. Filmed by Kedar Misani, Switzerland. Sri Chinmoy played this improvisation during a Peace Concert in Prague in 2004. Filmed by kedarvideo, Switzerland. Sri Chinmoy: Yes, I will speak on death. I shall have to repeat many things that I have said before, since I have written and spoken a great deal on this subject. The Bhagavad-Gita, India’s great spiritual epic, tells us that just as we discard a wornout garment and accept a new one, even so the embodied soul discards this body and accepts a new one. The soul is eternal and immortal; weapons cannot cleave it, fire cannot burn it, water cannot drench it, wind cannot dry it. It is invincible. Now, in the external life, I have two rooms: a living room and a bedroom. In my living room I write, I work and I talk to people. In my bedroom, I take rest; I sleep. In my living room, I have to prove that I exist. In my sleeping room, I have only to take rest. Now in the spiritual world, the living room is life; the sleeping room is death. In the room we call death, life in the ordinary sense of the term is not there. I need no one when I am in this room, because I go there to rest. But people are afraid of this room because they feel that this room, death, is not theirs, whereas life is theirs. They feel that death is strange and alien and far away, whereas life is close and familiar. It is not true; both life and death are the soul’s possessions. Now as all of us here have accepted the spiritual life, the inner life, I wish to tell you a few things concerning spiritual death. In the spiritual life, we consider a man dead who is not aspiring and not making any progress. The man who does not aspire for a higher life, the man who does not care for progress, is more useless on earth than a dead man. The question then arises: what should a man do who wants to aspire and make progress at every moment? What should he do? He has to be conscious all the time of what he is doing and what he is not doing. He has to be conscious in the physical, in the vital, in the mental, in the psychic and in the soul. He has to place his mind and his body inside his soul, so to speak, and then he will see that his life can be turned into a constant progress. The higher and deeper reality can be easily brought forward into his physical existence. This is the first step. Now to go back to death. Why do we die? Almost nobody wants to die, but in spite of our intense desire to stay on earth, we are compelled to leave the body and pass behind the curtain of eternity. Why? Simply because this earthly body of ours is imperfection itself. It cannot play the game of life unendingly and divinely. It is limited. After a few decades of existence on earth, it requires rest. If the physical body could play its part in the Divine Lila (the Divine Drama) in a divine manner, we would never have to experience death. But the body is not yet divine. Yet a day will dawn when this physical body of ours will aspire to receive higher peace, higher light, higher power and will bring them down into the physical plane itself. At that time, the necessity of death will not exist at all. Remember that it is the body that dies and not the soul. The body dies but the soul goes back to its own home and takes rest. The soul is very, very wise. It does not forget what it did on earth; it carries with it the essence of the experiences that it had while it was in the land of the living. When the body dies, the soul slowly and steadily, at the appointed hour, passes beyond the subtle physical plane, the vital plane, the mental plane, the psychic plane and finally enters into the soul’s region, there to take rest. What does the soul do there while resting? It tries to assimilate its past experiences, the essence of thousands of experiences which it had on earth. Here it attempts to determine its new incarnation, new environment, new society, new possibilities, new aim and new vision for its earthly journey. When the determination is complete, it goes to the Supreme. The soul reveals everything to the Supreme and with His kind approval, it enters into the world again. It comes with new hope, new life, new determination and new willpower to unveil its inner potentialities and at the same time, to manifest the Divine in the most beautiful and most fulfilling way. The soul tries to bring all the gifts and achievements of its own previous evolution into play for this fullest possible manifestation. Each birth and each death has a special significance. Through each birth and death, the sempiternal life gains a special experience in its cosmic game. They say that we die only once, but this is not true. At every moment an ardent aspirant feels that he has had a death and a new life. The soul is moving from one momentary experience to another. The moment we go beyond the barrier of ignorance, the realm of ignorance, we die. Why? Because we are born into a new world of inner wisdom. When we go beyond the realm-boundaries of ignorance, we actually enter into the realm of light and peace, and that is what we call dying at every moment and having a new birth. When I, as an aspirant, go up, what do I do? I go towards my sel-frealisation. When God, the Divine within me, enters into the world, He goes towards His Self-Manifestation. Humanity is the fertile soil to grow Divinity. Divinity discovers its unique truth only in humanity. And when humanity is transformed radically and integrally, we will have a life of perfect Perfection. This will be the integral and absolute transformation which mankind dreams of, a transformation of the body, the vital, the mind and the heart. Later will come the total transformation of society. In that Golden Hour, death is bound to leave us for good. Immortality will breathe in us and through us perpetually. Let us all concentrate on that Golden Hour. On August 27, 2001, Sri Chinmoy (1931-2007) celebrated his 70th birthday in Jamaica, Queens, NY, and gave many special concerts, among them performing on 70 instruments. Watch the highlights in this video. Length: 1:08:20 h. Filmed and edited by kedarvideo, Switzerland.